Adams Michael, Anand Viswanathan, Aronian Levon, Bologan Viktor, Carlsen Magnus, Caruana Fabiano, Dominguez Perez Leinier, Fressinet Laurent, Gashimov Vugar, Gelfand Boris, Grischuk Alexander, Ivanchuk Vassily, Jakovenko Dmitry, Jobava Baadur, Kamsky Gata, Karjakin Sergey, Kramnik Vladimir, Leko Peter, Mamedyarov Shakhriyar, Nakamura Hikaru, Nepomniachtchi Ian, Ponomariov Ruslan, Radjabov Teimour, Riazantsev Alexander, Svidler Peter, Tomashevsky Evgeny, Wang Hao, Wojtaszek Radoslaw. Which of the following 2 time controls should be used in final stages of World Championship Cycles? The following 2 rapid time controls are widely used. 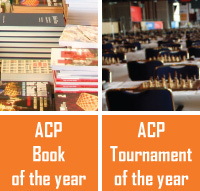 Which of them should be used in World Rapid Championships? The following 3 blitz time controls are widely used. Which of them should be used in World Blitz Championships? Please sort the possibilities from best to worst. 0,5 arises when a player doesn't give a preference between 2 possibilities. The following 5 time controls are widely used for sudden death games. Please sort them from best to worst. Not all out of 28 players answered that question. The opinions were widely spread, however it is still possible to take a conclusion, that the option 5'-4' (white has 5 minutes, black has 4 minutes; white has to win) was clearly preferable, whereas all other 4 options were at more or less the same level of support. The ACP would like to thank all the top players for taking part in the survey and for all additional comments that we have received.